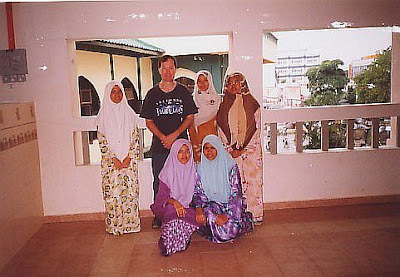 I had only been working in Malaysia for a couple of weeks in 2005 when the Chinese New Year holiday hit. Being that I was new here, I didn't know what to do with myself during the week I had off. My wife was then my fiancee, and still in the Philippines, waiting for me to get settled here and send for her. So I looked in the Lonely Planet guidebook, to see what interesting places I could go to. Malaysia is filled with all sorts of beautiful and interesting places to go to. It's one of the reasons I like it here so much. Then there is the great food, and the friendly people. It's probably the best country in Asia to work in if you are an ESL teacher like I am. At that time, though, I was still a newbie here, and I wanted to get out and explore. I wanted to get as far away from KL as I could. And what place was farther away than Kelantan, the state up in the Northeast bordering Thailand? Then I read about the Jungle Train, and decided that it was for me. A nice ride through Taman Negara Park, and my first up close view of the Jungle? Yeah, that was for me. Unfortunately, I couldn't get up early enough to get the jungle train, so I took a later one. One that supposedly would have us getting into Kota Baru just after daylight. Well, nothing ever runs on time in Asia, and sure enough, I had plenty of time to see as much jungle as I wanted to. When I made it into Kota Baru, I found that almost everything was closed for Chinese New Year. There really wasn't anything to do. It was very disappointing. All I could do was look for a cheap hostel to stay in, and see what I could do in the morning. I looked around to see what I could see. Mostly I saw a bunch of locked buildings, and closed museums, and people wondering what the heck I was doing wandering around aimlessly. The next morning, I decided to get on out of there. I went to the bus station, to see if I could get a ticket to somewhere. Anywhere. Unfortunately, all the tickets to somewhere and anywhere were sold out. Not that I knew where any of the somewheres and anywheres listed were. 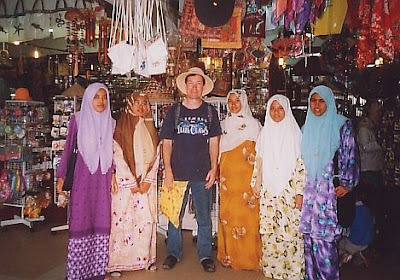 I was walking around, trying to figure out what to do and where to go, when I noticed a group of girls, dressed in traditional garb, following me. I turned around, and they turned away shyly, and talked among themselves. It was cute. I wondered what was up, so I took a few steps toward them, and pretended I had a message on my cellphone. "Hi, we are students. We have an assingment. We have to interview a foreigner. Do you mind if we interview you?" At last- something interesting to do! I suggested we sit in the gazebo nearby, but it turns out that it was reserved for women only, and I don't qualify. So we went of to the Central Market. We found a tea stall, and I bought all of us tea. They asked me questions, and I answered them in my usual friendly way. I asked them why they chose me. They said the other foreigners who were there looked scary, and I looked friendly. We spent the next 3 hours talking. When we were finished, they gave me a little handcrafted bookmark as a present. Then, they wanted to take me to see the sites, but everything was closed. So we went back to the Central Market, and looked for something for my apartment. Before they left, they took the pictures you see here, as proof that we had talked. Hi John....thanks so much for reply my email. I didn't expect that you will reply it very fast. Actually, in my first email, I forgot to tell you something about our assignment,in the english programme we participated in these two months, we were giving three group assignment to do, and only in this task-tourist interview, we were giving an opppurtunity to chose our own group members. After finishing our task-looking fot tourist, we need to do a presentation in front of our class where we need to choose a tourist who we like most and tell about him/her in front of our class.And we-kelantanese's girls, decided to tell them about you! We told them that you are our first unexpected tourist we met and we spent almost 3 HOURS only with you! We also told them about your kindness where you treat us tea. Even though it is only a tea, but it is the first time in our life when the foreigner tourist treat us! At first, they didn't believe our story, but when we show them you writting...fuh,luckily they believe us. And the most important is...on the closing ceremony of the programme, we were announced as the best group because we managed to do about 19 interviews with more than 30 people in 8 days! What a amazing experience we ever underwent. Frankly, we didn't expect to be a winning team because we did the assignment just for fun. A first and interesting experience with you make us like addicted to meet more tourist and talk to them. Okey...I think my email is too long...and maybe you got to be bored to read my email. Thanks again and sorry because my english is not too good. May be if you want to come to kota bharu again, you can tell us, right!